We are happy to announce the first digital Mindfulness Badge for Teens! If you have completed a mindful breath training, complete the activities of the badge. Once you’ve successfully illustrated your skills, you will be able to add this digital badge to your resume for colleges and future employers. 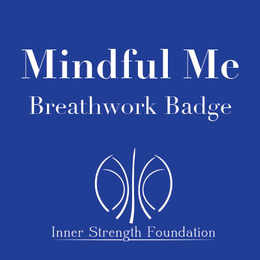 The Inner Strength Mindful Me Digital Badge was created in cooperation with Drexel University, LRNG, and Digital OnRamps, leaders in digital certification. We are inspired to make a standardized teen mindful breath badge a highly prized skill that employers and admission officers will recognize and value. To earn the badge, you must successfully complete 4 of the 7 activities (called XPs or experiences). You’ll have fun uploading your own guided mindfulness exercise, showing correct posture, and talking about how this practice of focused awareness has helped you.